What to Expect During an Episcopal Service. Episcopalians worship in many different styles, yet all worship in the Episcopal Church is based in the Book of Common Prayer, which gives worship a familiar feel, no matter where you go. Worship in the Episcopal Church is “liturgical.” For the first-time visitor, the liturgy may be confusing, however, the congregation follows the service forms and prayers in the Book of Common Prayer that don’t change greatly from week to week. Services may involve standing, sitting and kneeling, as well as sung or spoken responses, that may provide a challenge for the first-time visitor. Here’s what to expect. We begin by praising God through song and prayer, and then listen to as many as four readings from the Bible—usually one from the Old Testament, one from the Psalms, one from the Epistles ( Letters), and always a reading from the Gospels. The psalm is usually sung or recited by the congregation. After the sermon, the congregation recites the Nicene Creed. Written in the 4th Century, it is the Church’s statement of what we believe. All baptized Christians‚ regardless of age or denomination‚ are welcome to receive communion. You may eat the bread then or hold it until the wine comes. A Eucharistic minister with a chalice of wine will stop in front of you and say, “The Blood of Christ, the cup of salvation.” You may either drink directly from the chalice or, if you saved your bread, the Eucharistic Minister will dip it into the wine and you will consume both together. When you have received both bread and wine, you can stand and return to your seat. If you do not wish to receive the Eucharist you are welcome to come forward during the Communion to receive a blessing from the priest. If you wish to receive a blessing, instead of holding your hands out to receive the bread, simply cross your arms over your chest. Music at Holy Trinity. Music is important to the Episcopal faith; we draw from a rich tradition of Anglican music. Throughout a service, the congregation will sing hymns from the hymnals located in the pews You do not have to have a terrific voice to join in the singing! Join us for coffee after the service. Following the 10:15 service, the congregation is invited to the Parish Hall for coffee hour. This is a popular tradition in the Episcopal Church. Members of our parish each take a turn preparing coffee, pastries, fruit and cheese and crackers. It’s a good time to meet people, talk to the clergy, and learn more about all Holy Trinity has to offer. Any questions? 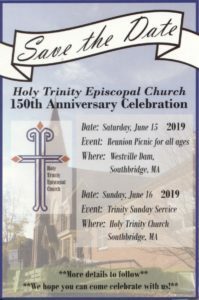 Feel free to call the church at 508-765-9559 and ask to speak to a member of the clergy or vestry. If one is not readily available, we’ll make sure you receive a return call. You can also send a request for information by email at our contact page.